Just sitting here at about 9pm, having recently finished a little light reading and a little earliler a much heavier dinner of spicy sausage lasagna. “Here” is in Van Donop bay in Desolation Harbor, where today’s 13 hour cruise from Montague Harbor finds us. The way up, through the infamous Dodd Narrows, and past a thriving Nanaimo, is best described as tedium mixed in with wonder, as long cruises often are. 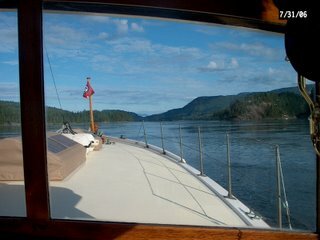 The wonder today often revolved around the miracle of navigational technology and how seamlessly it fits into the environment of an 80-year old classic wood boat where we still use a knotted string tied to the wheel to help the vessel go straight. calmed it with baby oil. Finally at around 7 we gained our night’s destination, dropped anchor in a peaceful lilttle cove, had dinner and cracked open our books and magazines. Tim just woke from a nap, promptly turned on the propane heater, despite it being a very comfortable 68 degrees. We’ll now view our much-anticpated Hogan’s Heroes DVD and I will undoubtedly turn into my bunk at around 10pm, fiddling with my AM radio, and if not finding that receptive, listening to some tunes on my player. I shall be sound asleep by 1030. Tomorrow we head for the warmer waters of Desolation Sound proper, where a day of laughing at Tim trying to water ski awaits. We had lasagna for dinner--very delicous.